Typically while we, at Sitka Log Homes, have been working away on your log work you have been clearing land, building roads, excavating and having your foundation and sub floor prepared. 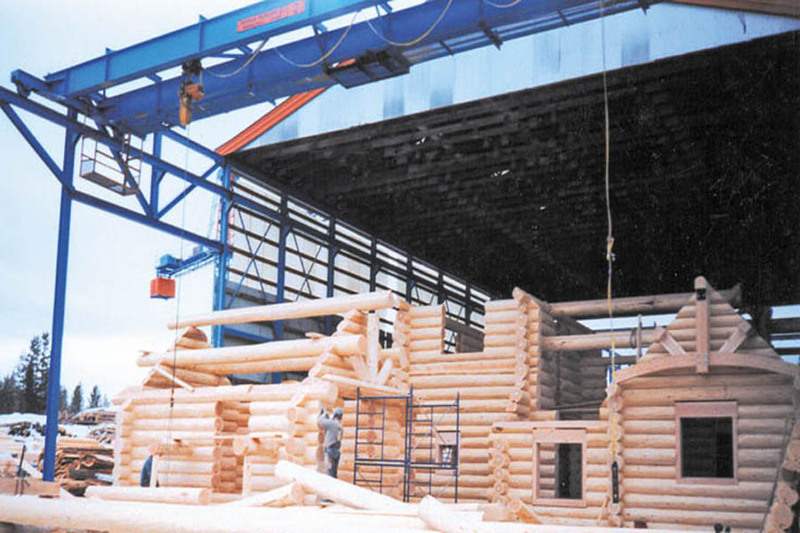 The following are some important things to consider before your handcrafted log home arrives. When your driveway is being laid out with your excavator you must allow ample width for large trucks and other machinery. The loaded trucks with your logs are very long and heavy and do not maneuver well on soft narrow winding roads. A hard pack gravel access to your home is something you will need anyway so if this is done at the beginning while machinery is present it will save money in the end. Any under brush or tree limbs hanging out into the driveway must be removed so as not to scratch the truck or hang up on the logs as they pass by. It is equally important to have the back fill complete around the house. Ditches must be filled in and mounds of dirt or gravel should be flattened. It is important to have a work site free of debris to avoid the delay of the set up crew having to do it when it is time to start setting up the logs. Keep in mind that the more trees left close to the house in the area the crane may be working, the more time it will take to move each log. The position of the crane to the proximity of the log trailer and the log house is very important. Your sub-floor is complete and should have all the sheathing applied to the top. Any fireplace opening or open stairwells should be covered temporarily during the log set up to avoid anyone falling through. The floor should be free of material and waste. The homeowner usually organizes the crane. The size of the crane is determined by its proximity to the sub floor, the weight of the heaviest lift and the distance to the farthest wall. It is important to have an experienced crane operator. A good work crew is as important to you as it is to the Sitka supervisor that will be instructing them to put your home together. Five workers are usually enough. A good mix is your Sitka rep, at least two carpenters with tools and who are not afraid of heights, and two strong helpers. Often, the contractor supplies the set up crew, as he is familiar with the job and has any tools required to see it through. Most homes have log roof systems that require a lot of temporary bracing. It is important to have long lengths of 2X4 or 2X6 on hand to secure the roof components until the framing is complete. You cannot have too many extension ladders and step ladders. ½" or ¾" electric drill. 2 - 3/8" electric drill with 5/16" hex head driver bits. 1 extension ladder 20' +. 2 large utility knives to slice insulation. 1 staple gun c/w ½" or 9/16" staples. 1 tool pouch c/w 25' tape, hammer and chalkline. 3" or 3 ¼" double headed nails ( 5-10 lbs.). 1 decent sized chainsaw c/w files, gas and chain oil. ½" drive ratchet (3/4" is better). 1 1/8" and 15/16" sockets for above ratchet. If you could supply a ½" drive electric impact, it would save a lot of manpower bolting the log trusses together (if applicable) with ¾" lag bolts. Gable ends should be built and sheeted before the logs arrive. Your contractor will build your gables on your sub floor. They can be lifted away temporarily by the crane just before the logs are placed on the sub floor. You will have received gable plans from Sitka that have details and dimensions tailored to your home. The height, width and pocket sizes must be followed carefully. In all likelihood electricity has been put into the property, but if not it is required that you provide temporary power. Drills are used to drill through bottom logs into the sub floor and often a skill saw is used as the house goes up. Do we hire dealers to sell our log homes?